Welcome to Homeworld – no ordinary company! 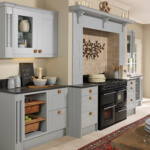 Looking for a new Kitchen, Bedroom or Bathroom? Our experienced team will guide you every step of the way from concept to completion. 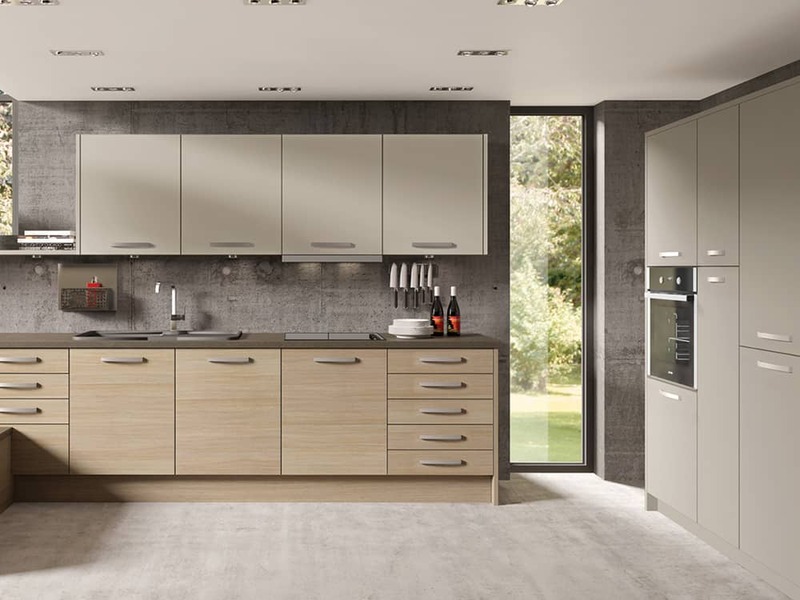 At Homeworld you will find a huge selection of Quality Kitchens, Bathrooms and Bedrooms and unrivalled customer service. It is our privilege to introduce our collection of beautiful kitchens and bathrooms. 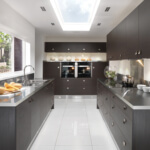 We are leading kitchen and bathroom designers and installers with decades of experience in the kitchen and bathroom industry. 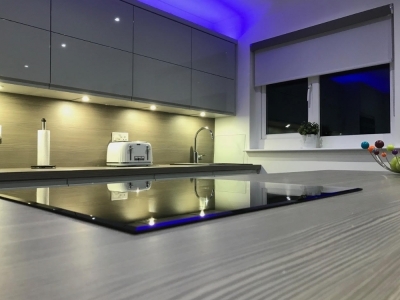 Homeworld is a family owned business with kitchen and bathroom showrooms in both Kirkintilloch and Falkirk. 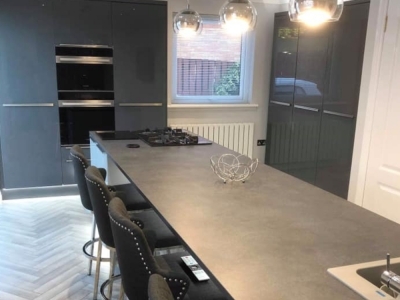 Our experienced kitchen designers use the latest 3D software to take your kitchen ideas and create your dream kitchen or bathroom design then our skilled tradesmen make your dreams become a reality. 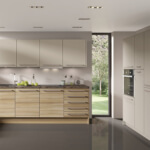 Kitchens: – Our specialty is kitchen design and installation. We take care of the whole project including home design visit, 3D kitchen design, installation and project management, we will even take care building work and of any documents required. 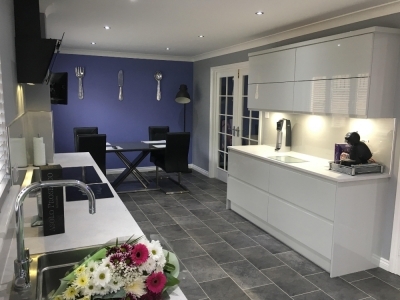 Come visit our kitchen showroom in Kirkintilloch and Falkirk and see our range of displays including modern kitchens, traditional kitchens and painted kitchens. 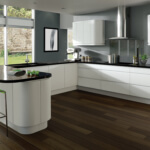 Bedrooms: – Homeworld provide a massive range of fitted bedrooms with clever storage ideas. We can take care of the design installation and project management of your new fitted bedroom. Bathrooms: – Homeworld will design a unique and bespoke bathroom for your home. 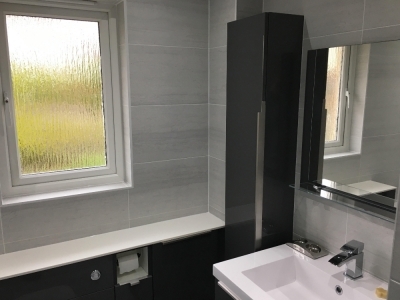 Choose from a wide selection of modern and traditional bathroom ranges and our experienced designer will provide a 3D plan to help visualise your new bathroom in your home. 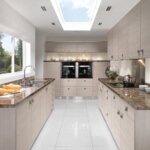 Kitchen and Bathroom Design: – At Homeworld we do not employ sales people, instead our showroom staff are experienced kitchen and bathroom designers that are highly trained in the latest design techniques and product knowledge so that you can be sure you get the best possible advice when thinking of a new kitchen or bathroom. 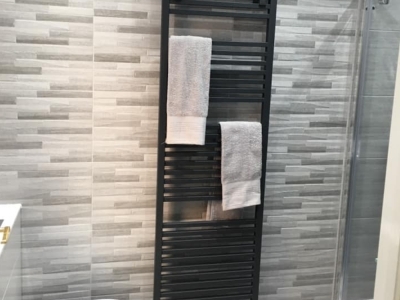 If you would like to discuss your kitchen or bathroom ideas with a Homeworld kitchen and bathroom designer, please book a design visit below and we will call you to arrange a convenient time. 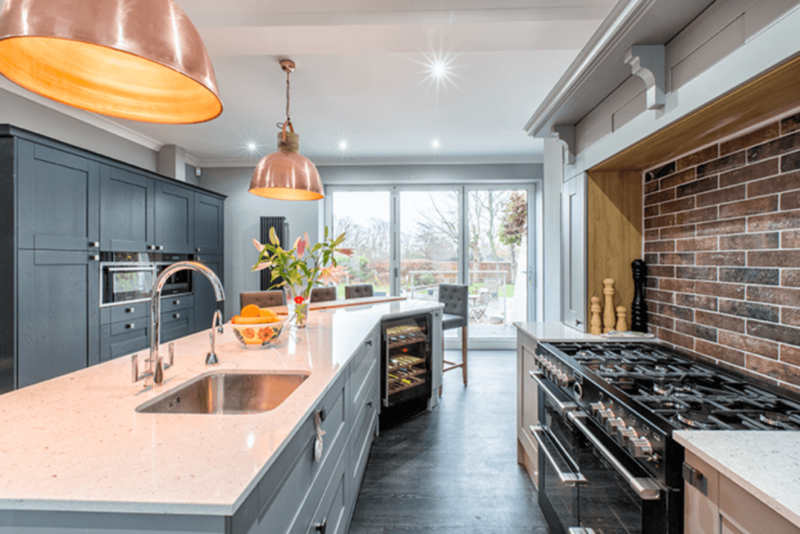 Choosing a new kitchen or bathroom can be a daunting task and that’s why Homeworld offer a free design service to help guide you through the process from start to finish. Our trained and experienced design team are on hand to help you every step of the way. Still love my kitchen that Bruce from Homeworld designed almost 2 years ago. On 5 Sept I telephoned Bruce with a minor issue with our kitchen drawer. Appointment was made for today for drawer to be fixed and this matter was resolved today by Dave who was very friendly and very professional. 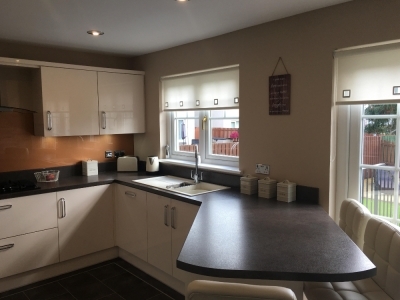 Great after care service 2 years after my kitchen was fitted. Well done Homeworld for this outstanding service. Would just like to thank Homeworld for the fantastic job they did on our kitchen & bathrooms. The work was done to the highest standard & was seamless throughout. 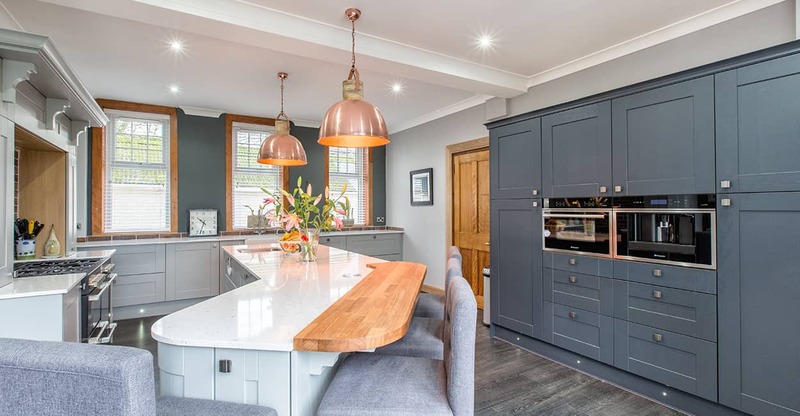 Cannot praise the whole team highly enough & have to give a special mention to Bruce who came to design our new look kitchen & bathrooms which have transformed our house & we would never have come up with the design ideas on our own. Cannot recommend this Company highly enough, thanks again. Celebrating the completion of our new open plan kitchen/family room. Professional, first class service from start to finish and workmanship from Joe Weldon and all the Homeworld staff involved in our project. Attention to detail outstanding with the customer at the heart of everything they do. Would highly recommend to anyone looking for kitchen, bathroom, bedroom or office design. Thank you all. Our Kitchen is a few years old now and is still as good looking as it was when it was installed. 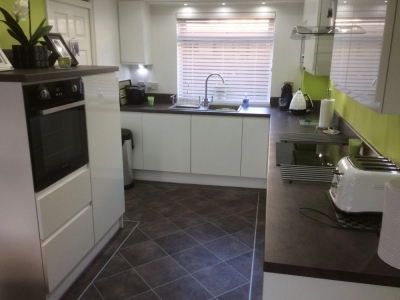 There is a varied choice of quality units and appliances and the fitting was done in an extremely efficient manner. Even when I changed my mind about location of sink and it had to be moved this was done with no fuss. This is a very professional, trustworthy company and I will have no hesitation in using them in the future. I have recommended them to friends who are also delighted with their kitchens. Would highly recommend Homeworld! 5* service throughout! Loving our new kitchen…thank you! 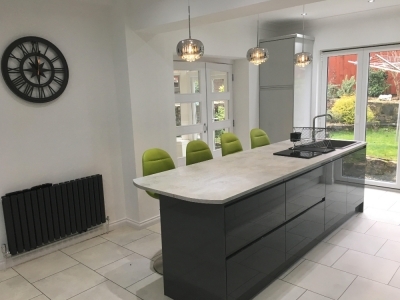 When we decided it was time to upgraded our Kitchen we had no hesitation in choosing Homeworld, as a previous customer we knew the service would be first class. From walking into the showroom to our kitchen being fully installed the service was excellent. 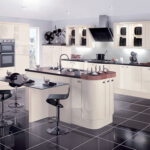 There is a wide choice of units and work tops which are all of a high standard. Joe designs are excellent and is eye for detail is top notch. 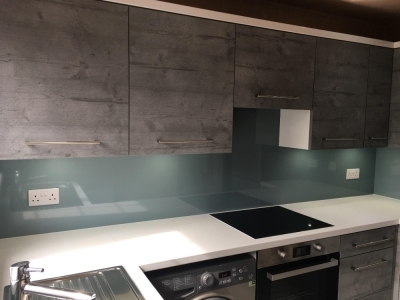 Everyone who was involved in the fitting of our kitchen were friendly, polite and most importantly professional. I would have no hesitation in recommending Homeworld.